No A/C in my room, just an inefficient fan, so windows stayed open and I breathed in smoky air all night. Not the best of worlds. About 4:00 am I sensed a change, the air was cleaner. 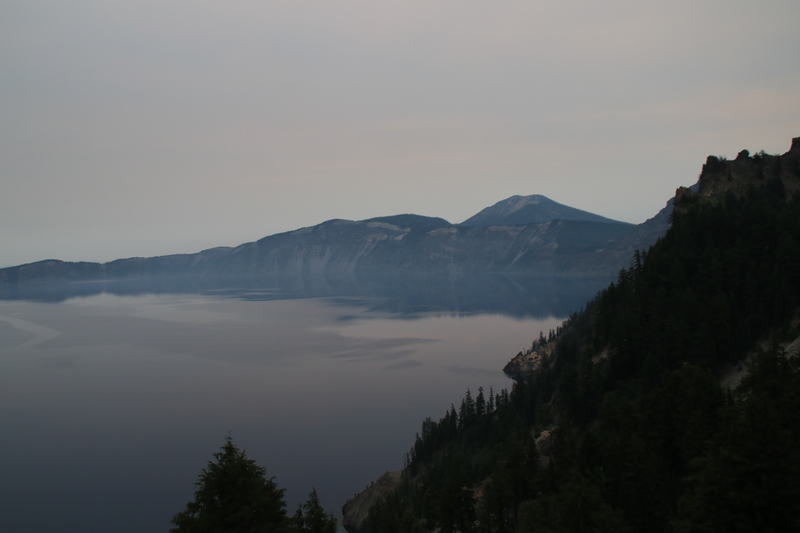 Apparently, that was the pattern at Crater Lake during this wildfire season. The atmosphere became wetter, denser, at night and pushed smoke upwards. 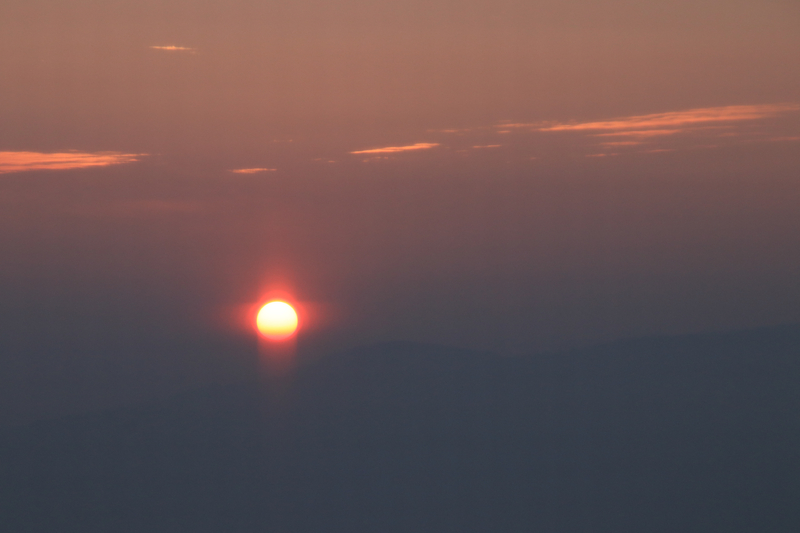 With sunup, the moisture quickly evaporated and smoke filled the air. 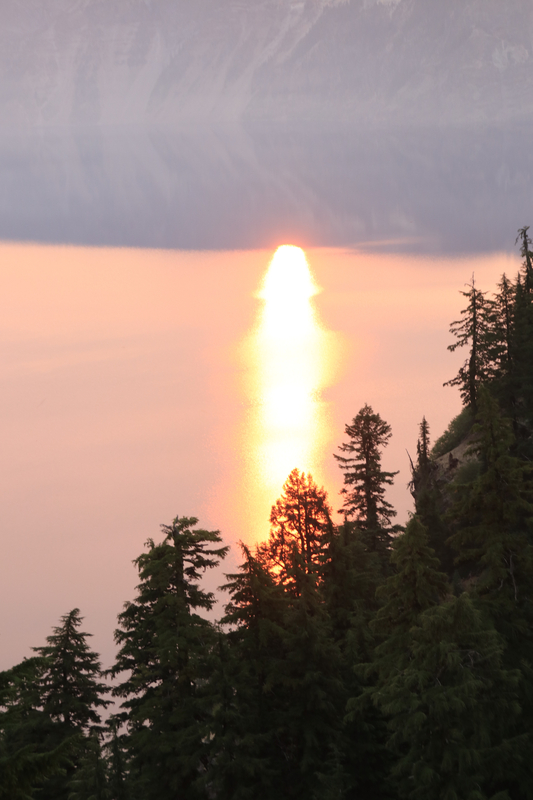 Smokey skies but a visible lake at dawn. By mid-morning, the lake was invisible from the lodge which sat 100’ above it. 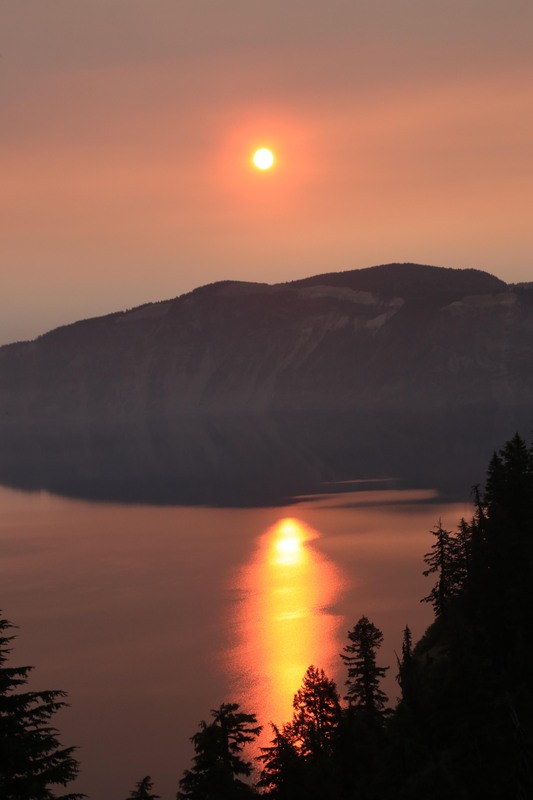 Unfortunately, all of southern Oregon and northern California were blanketed in smoke from hundreds of fires that raged from Mexico to the North Pole. 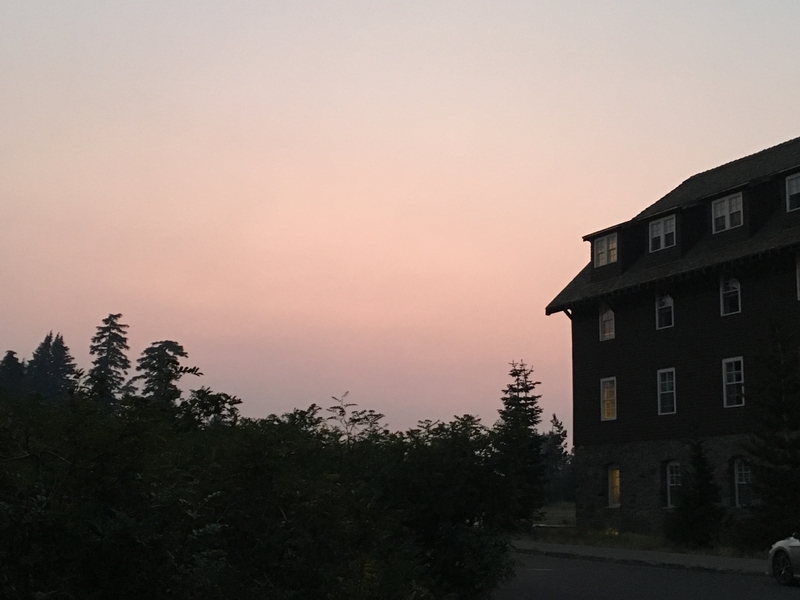 Smoky skies made sensational sunrises. The lodge faced east, the sky lightened about 4:30, by 5:00 I was outside with my camera. If I squinted, I could almost see across Crater Lake. It was reassuring knowing there really was a lake there and a huge one. 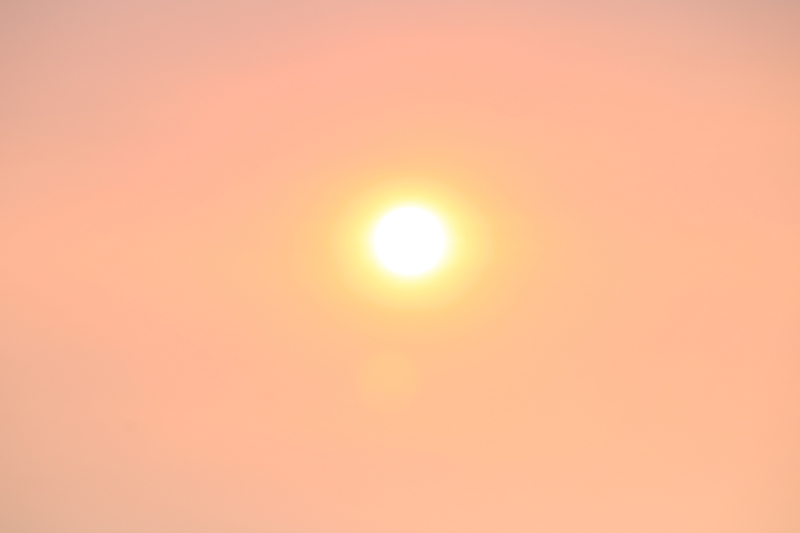 I wanted to capture as much of orange/yellow/pink/purple sunrise as I could. 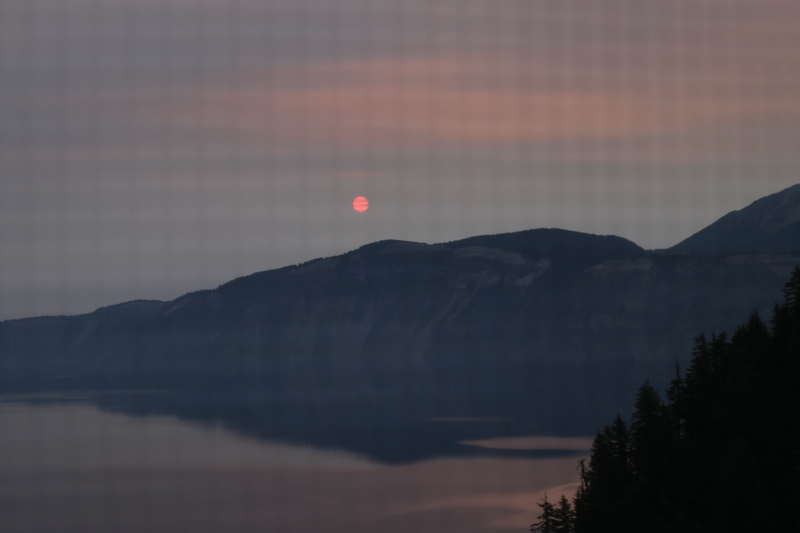 The sun didn’t actually breach the rim of the crater until 6:06 a.m.. Before sunup the sky was bright but dull. The sun wasn’t a distinct ball, it was fuzzy as if hungover from partying with the moon all night. The sun was an orange ball for a few seconds, then darkened and the reflection off the lake was blood red. It was eerie, omen-ish, which caused me a little shudder. The blood red reflection on the water looked like a crime scene. Slowly, the sun pulled itself together, became not-quite-as-threatening as it transited upwards. I’ve seen ghostly blood moons before, but a blood sun was something else, something vastly more threatening, more sinister, and more immediate. Maybe it was Mother Nature getting even. Despite our shameful disregard for the earth, climate change is immeasurably bigger than the damage we’ve caused. It won’t last forever but could last centuries, or it could stabilize in a few years. Europe’s mini ice age lasted nearly six centuries with much colder winters, more snow, and more ice from about 1300-1870. The mini ice age didn’t cause the problems global warming is. I’ve read that both the Gulf Stream and the Prevailing Westerlies are slowing which will have serious repercussions. Not much I can do about any of that but that big orange ball outside my window had me worried. About ten years ago, when I was in the antiques business, I was shopping in L’Isle-sur-la-Sorgue, In the south of France, just east of Avignon. It’s the Fisherman’s Wharf of antiquing – a place that receives massive press, a place for antiques shoppers who don’t know any better, a place that is sprawling, overpriced, overblown. And yet, it’s a must-go-to place because, on occasion, one might just stumble upon something rare and incredible. Another reason for visiting was that my shipper, Camard, had its Provencal office there. It was a one person office and Annie was in charge. Camard’s facilities were just outside Paris. On my last day of shopping, I turned over all the buying information to Annie. Camard then dispatched a truck to pick up my purchases around the area and truck them to Paris for fumigation (for furniture), packing, creating customs documentation, and shipping. It was a lengthy process, usually about three months before the container landed Port of Oakland. Three or four backroads, left, right, right, left and we arrived. It looked like a junkyard. We drove through a gate and parked. It was a junkyard all right, a private junkyard. Monsieur Somebody, a scraggily looking gent in Bermuda shorts, blue checked shirt and Ivy League cap, greeted us. Annie translated as he had no English and the conversation was beyond my pathetic French language skills. “Bonbonnes,” he repeated over and over trying place exactly where he had seen them. The yard was huge, over a hectare, with every conceivable pile of consumer junk imaginable – stoves, ovens, refrigerators, toasters, fences, gates, doors, computers, bed frames, medical equipment, it was mind boggling. Monsieur Somebody called his thirty-something year old son from a shed where he was fitting some old pieces of wood into new “antique” armoire. It is a common in France that inexperienced and unsuspecting buyers are sold a phony for “a good price.” The armoire probably came from a half dozen different derelict pieces of wood, but usually not an old armoire, planed, sanded, stained, and sold as authentic. The finished product looked good but was not an antique and its real value but a fraction of the sales price. If one knows what to look for, spotting a phony is easy. Monsieur Somebody et fils were here to help. Junior made me nervous, a little unsteady, intense and twitchy. But Annie knew how to handle the situation and explained our mission to the younger man. He led us down a path and pointed to a mound of dirt. “Juste là,’’ he said (right there.) The bonbonnes were covered with dirt to protect them from accidental breakage and the weather. Junior, Annie and I dug them out, carefully, by hand, like archeologists at a great pyramid. We salvaged about a dozen and a half, in varying sizes, but in exceptionally good condition once junior hosed them down. There was another mound and I inquired what treasures might be buried. Pottery, I was told, old vases and vessels. We dug. Another dozen and half. Great find, not particularly valuable but old and interesting. I could sell them for a pretty profit. Monsieur Somebody then led me around his rubble yard to see if I was interested in old coffee pots, office chairs, radios and TV’s, car parts from Citroens, Renaults or Peugeots. Alas, no. My hands were filthy as were Annie’s and she asked if we could use the hose. “Non, non!” We were led into the house where Madam Somebody awaited us. Father, Mother and junior lived in a house with no running water. Madam directed me to put my hands in the sink while she pumped water over them. I died on a semi-clean linen. We packed the car. Annie said she would further clean the items before the truck came to collect them. With that, we bid the “merchants” a sad but fond adieu. On the way back, Annie told me the family had rented a stall at one of the pavilions at L’Isle-sur-la-Sorgue. They were quickly evicted after management learned the family was living in the back of the stall. The tipoff came when an evening security guard spotted a bonfire where the family was cooking its dinner. Monsieur Somebody confessed they liked the space because it had so many modern amenities like running water and plumbing. I paid about 30€ for the pottery and bonbonnes, but the day, as they say, was priceless. They saw us coming, recognized the $$ in our eyes and wallets. The saleswoman immediately latched onto some “hot ones.” It was the island of Murano, famous for its hand-blown glass and a short boat ride from the Rialto in Venice. Our hotel arranged the ride, no charge per se, though we more than paid for it on the other end. After a short tour of the glass making facility with the requisite glass blowers on duty to show us how authentic the place was, we were ushered into the upstairs showrooms. Most of the work gagged me, ornate, huge, garish, over-the-top chandeliers, vases, tabletop and decorative wall pieces. Ten feet into showroom #1, we were intercepted by the middle-aged saleslady whose English was exemplary and sales pitch just exactly what Americans would want, she knew all the colloquialisms. After sizing us up, she had some ideas. Nothing overly decorative, simple, small pieces with elegant design by a master designer. Two small vases and a plate later, I was significantly poorer though I do love the design, the intricacy, the craftsmanship that went into each piece. Much to the chagrin of the proprietress, we begged off and wandered around the fantastically colorful isle. The old houses were amazing, painted by an open Crayola box, every imaginable color, no namby-pamby pastels either. Bold colors. Besides lace making, Burano is a commercial fishing port. There were canals where they would be streets on the mainland with narrower walkways for pedestrians to navigate. Quitter than Murano, there were only a couple of restaurants but they were delightful. Seafood, of course, fresh off the boat. We ate and wandered and wondered at the amazing labyrinth of brilliantly painted buildings. Since we were no longer “hot ones” we took a public vaporetto (water bus) back to San Marco Square. The old black dog knew his customers. Despite the still early hour, I was tired from walking the back canals and alleyways but determined to see a truer Venice than the one that surrounded the preposterously busy Piazza di San Marco. No gondoliers in the back part of town, no Africans hawking fake Armani and Louis Vuitton products, no street performers, jugglers, hustlers, sidewalk portrait artists, no battalion-sized tour groups, no pricey boutiques, no trattorias back to back to back. This was the part of Venice where the year-round populace lived. There were a few bakeries, an occasional bistro and several neighborhood Coin grocery stores carved out of the ancient tenements. Every couple of blocks was an open square, sometimes with a tree and benches, sometimes just sun parched buildings with shuttered windows and thick wood doors. One slightly larger square had trees, benches and a café. Seating was al fresco although there were tables inside for inclement weather days and those winter months when the temperature can dip into the low forties. Not much English spoken in the periphery but, communication was not difficult. I was pointed to a table and was handed the menu. A few feet away, perched against an ocher colored building, was a large black dog, probably some kind of Lab mix, although I don’t know dog breeds very well. He was basking in the warm sun, tongue hanging, head swiveling, eyes darting, tail twitching. He paid me no heed and dogs aren’t very conscious of human gaze. Soon, his tail speed increased, he drew himself up and quickly strolled, head down, towards an approaching young woman. She greeted him by name, Cupid, patted him on the head a few times, and went inside for her morning cappuccino. Other customers followed, each time the dog rose and walked over to greet, was patted on the head, with an occasional aside conversation from older men who might well have been greeting their pastor or a life-long confidant. The dog seemed pleased to be on intimate terms. Perhaps some of the daily clientele came because of the friendly dog. When an occasional tourist stopped by, Cupid paid them scant attention. I suppose one needed to make the initial contact to get in his good graces.